With the help of terrestrial LiDAR, RTK GNSS, close range photogrammetry and electrical resistivity tomography (ERT), multi-source datasets will be captured for the analysis of surface and subsurface characteristics of different landforms (e.g. a glacier and a moraine). After exhausting field work the Obergurgl University Center provides us with great accommodation and a perfect working environment for data processing. Yesterday the field trip has started with an overview hiking tour from Obergurgl via Hohe Mut mountain to the Rotmoosferner glacier in the beautiful Rotmoos valley. Find some impressions in the pictures below. 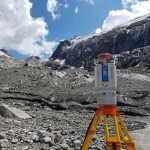 Today one group captured the lower tongue area of the Rotmoosferner glacier with terrestrial LiDAR. 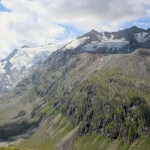 A second group measured an ERT profile across an end moraine of the Rotmoosferner glacier from the year 1850. A third group did photogrammetric and RTK GNSS measurements around the area of this end moraine. We will keep you updated about the field trip with daily posts - stay tuned! 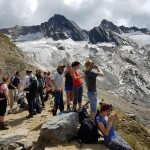 the Innsbruck Summer School of Alpine Research 2019 is the perfect opportunity! now established Summer School of Alpine Research.